You are browsing the Blog for baking. 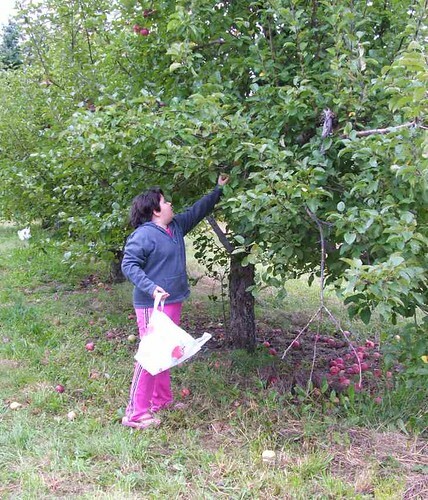 I live in apple country here in the Northeastern part of the US (central Massachusetts) so I am situated in the middle of many thousands of acres of apple orchards the year round. In the spring we are surrounded by the most beautiful white flowering trees who later bless us by their sweet and tart bounties. 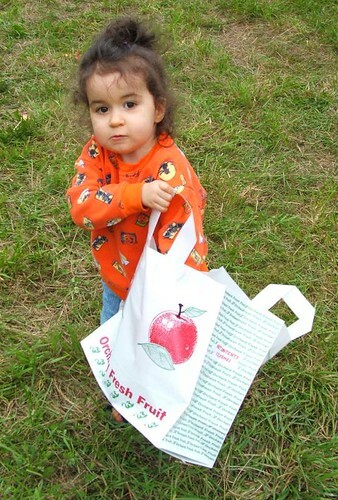 We usually go and make an afternoon of picking apples in the fall. 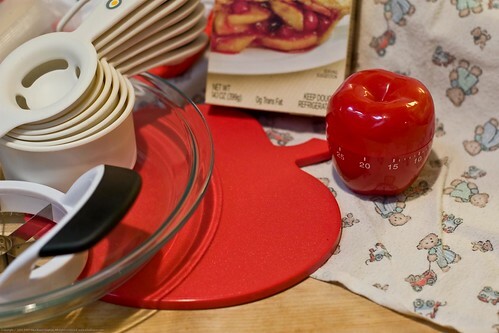 As a fun way to celebrate the fall, I have been given this neat pack of tools and ingredients one can use to make a splendid apple pie by Pillsbury and MyBlogSpark. (I received the sample pack for free but was under no obligation to write about my experience with these products). 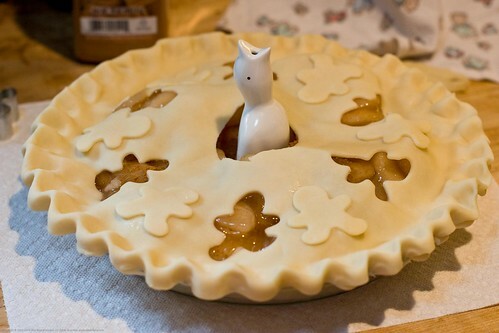 Pie crust can be a challenge for beginning cooks but that should not completely bar you from making an amazing pie for your upcoming holiday dinners (impress the in-laws! your mom!). I have tried the cheap store brand crusts and have always been let down. Having received this free pack, I tried the premium Pillsbury crusts and can report a real, honest, qualitative difference between store brand and Pillsbury. If you are not going to make your own, give these a try, let me know if they work out for you. 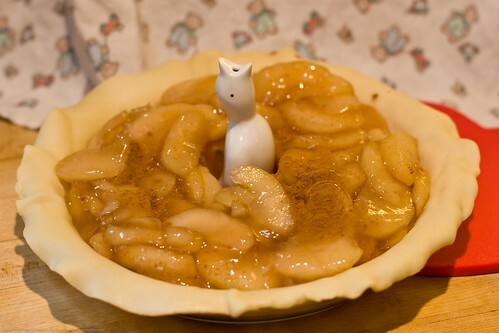 I am going show how I made this delicious pie below! Pre-heat your oven to the temperature recommended on the package. 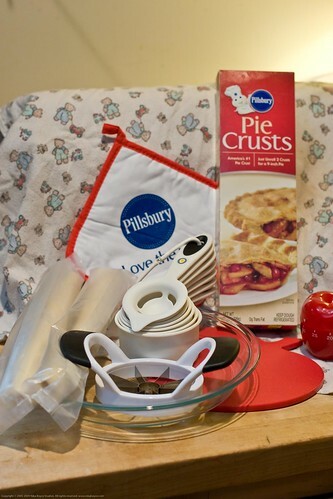 Allow your Pillsbury refrigerated pie crusts to come to room temperature (about 15 minutes on the counter top) and then carefully un-roll one of the crusts. Put that crust on the bottom of your pie plate. 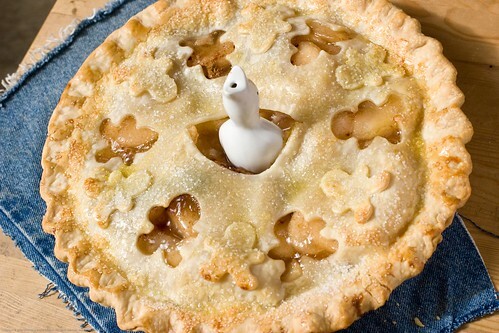 I added a pie bird because a) I have one and b) I thought it would look neat with it. 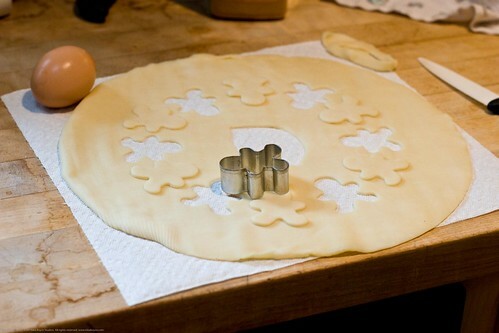 Carefully un-roll your second pie crust and prepare it the way you would like. The following illustrates how I did my decorations. 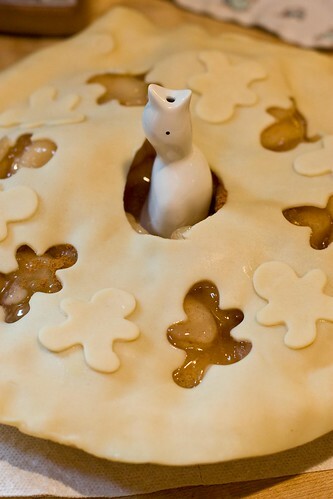 Cut out windows and use extra crust to decorate second layer. 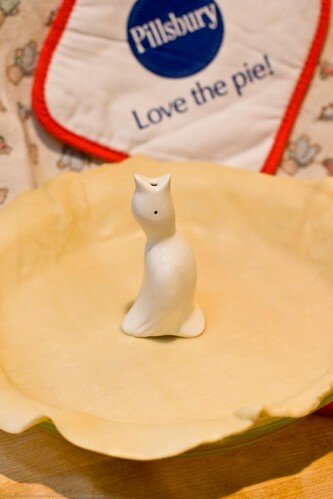 Put the top crust on the pie, brush where the two crusts meet with some egg wash. 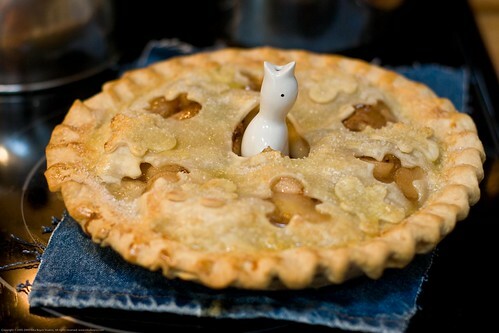 Apply an egg wash over the top crust and sprinkle with large chunky sanding sugar crystals. 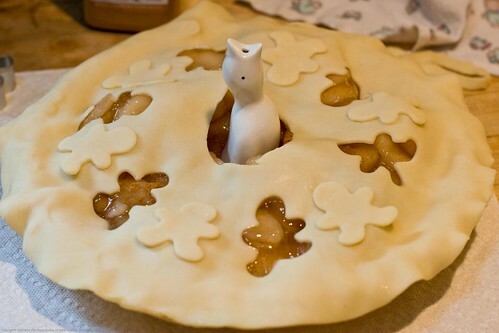 Bake as recommended for your filling! Remove and cool some what before serving. – I recommend serving it with a slice of sharp cheddar as we do here in New England. After the contest is closed, I will choose the winner with a random number generator. 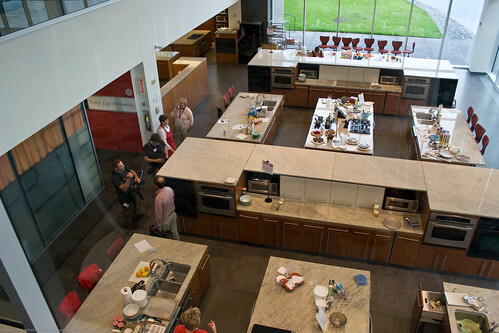 My two amazingly action packed days at General Mills and the Betty Crocker kitchens still boggle me – we got so much done! From the moment we arrived at GM, I am visualizing those first few moments walking through their front door, we were enveloped by a well oiled and very welcoming machine composed of the nicest people who seemed honestly excited to see us. One of the first things we saw in the lobby was a welcoming sign in spanish as we were a sub-group of a larger group of bloggers – the latina bloggers (blogueras if you will). That sign was similar to the one you see below that welcomed us on the second day. I am going to go a bit backward in this post and share with you a recipe we cooked, in teams, on the second day in the kitchens you see below. Notice the film crew? Yeah, I did too. I tried to duck them as much as possible but I fear there is video out there, of me – if you find it, dont tell me, I just cant watch! There is a lot more about the beautiful GM campus but I will leave that for another post. Today I am going to share this easy but beautiful recipe for crepes made with Bisquick, filled with a delightful lemon cream and raspberries. When we were making this in the test kitchens, we had a lot of fun making the delicate crepes. They look delicate but are actually quite easy to make. You get a great sense of satisfaction making these because they come out so pretty – very photogenic. 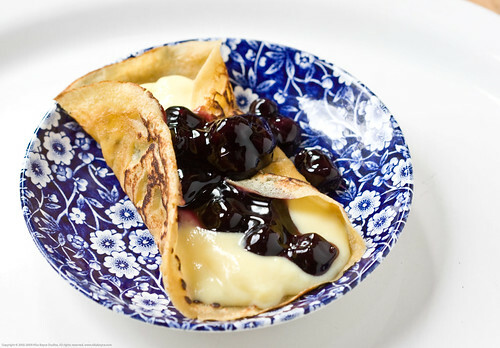 For those of you following from homes where you might make your own bisquick mix or might wish to use a whole wheat alternative I will blog a similarly delicious flip/side to the delicious crepes you see above – whole wheat buttermilk crepes with homemilked goats milk custard and blueberries. Stay tuned for that post. 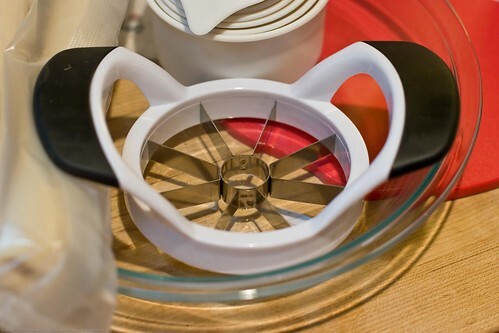 In small bowl, beat Bisquick mix, sugar, 1/2 cup milk, the melted butter and eggs with whisk or fork until blended. Grease 6- or 7-inch nonstick skillet with shortening; heat over medium heat until bubbly. For each crepe, pour 2 tablespoons batter into skillet; immediately rotate skillet until batter covers bottom. Cook until golden brown on bottom side. Run wide spatula around edge to loosen; turn and cook other side until golden brown. 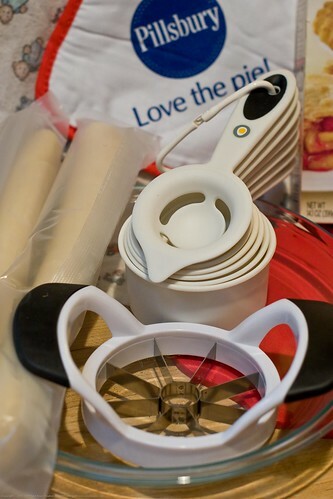 Stack crepes as you remove them from skillet, placing waxed paper between each; keep covered. Enjoy! Let me know if you try these – they are sure to impress your friends and family. 1 Serving (1 Crepe) Calories 240 (Calories from Fat 120),Total Fat 14g (Saturated Fat 8g,Trans Fat 1/2g), Cholesterol 75mg; Sodium 300mg; Total Carbohydrate 23g (Dietary Fiber 2g, Sugars 15g), Protein 5g; Percent Daily Value*: Vitamin A 10%; Vitamin C 8%; Calcium 15%; Iron 4%; Exchanges:1 Starch; 1/2 Fruit; 0 Other Carbohydrate; 0 Skim Milk; 0 Low-Fat Milk; 0 Milk; 0 Vegetable; 0 Very Lean Meat; 0 Lean Meat; 0 High-Fat Meat; 2 1/2 Fat; Carbohydrate Choices:1 1/2; *Percent Daily Values are based on a 2,000 calorie diet. 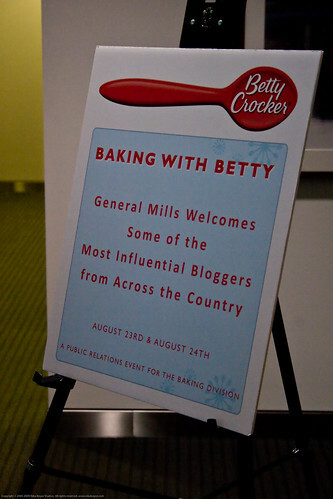 As you know, I got a chance to go visit the Betty Crocker test kitchens at General Mills this week and I had such fantastic fun! There is quite a lot to talk about, photos to share, video to taunt you with, various topics like recipes, kid friendly adaptations of more traditional recipes, and a walk through of the food photography studios at General Mills. All of this will take a few days to post so stay tuned! 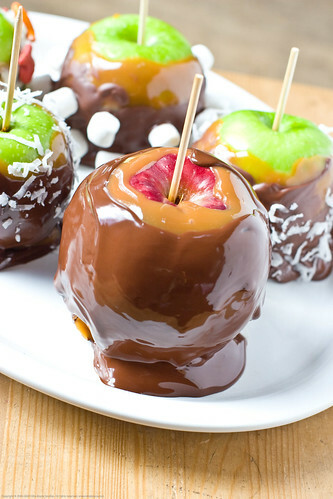 I am not going to just taunt you with photos but I am also going to share the recipe for this delicious treat below. Heat oven to 350Â°F. Make and bake brownies as directed on box, using butter, eggs and any of the pan choicesâ€”except line pan with foil, then grease foil on bottom only for easier removal. Cool completely, about 1 hour. 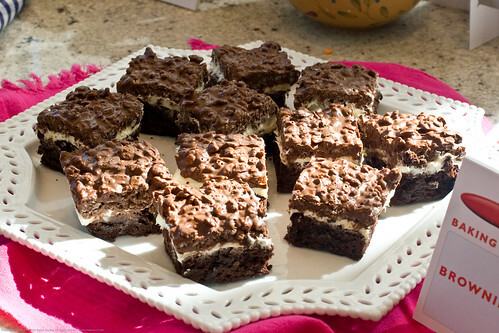 Spread frosting over brownies. Sprinkle with peanuts. Refrigerate while making cereal mixture. In medium microwavable bowl, microwave chocolate chips and peanut butter uncovered on High 1 to 2 minutes, stirring once, until melted. Stir in cereal. Spread over frosted brownies. Cool completely before cutting, about 1 hour. For bars, cut into 4 rows by 4 rows. Store tightly covered at room temperature. 1 Serving (1 Bar)Calories 370(Calories from Fat 160),Total Fat 17g(Saturated Fat 7g,Trans Fat 1g),Cholesterol 35mg;Sodium 210mg;Total Carbohydrate 47g(Dietary Fiber 1g,Sugars 34g),Protein 5g;Percent Daily Value*:Vitamin A 4%;Vitamin C 0%;Calcium 2%;Iron 25%;Exchanges:1 Starch;0 Fruit;2 Other Carbohydrate;0 Skim Milk;0 Low-Fat Milk;0 Milk;0 Vegetable;0 Very Lean Meat;0 Lean Meat;1/2 High-Fat Meat;2 1/2 Fat;Carbohydrate Choices:3;*Percent Daily Values are based on a 2,000 calorie diet. Stay tuned for more decadence!